We are offering a vibrant collection of pink cotton canvas bags (GB19) that are manufactured from top quality fabrics thus making them a good choice for every age group. These bags are known for their elegant designs, lively colour combinations and eye catching patterns. We offer these bags in different sizes thus meeting the varied needs of our clients and also at very reasonable prices. We are looking forward to serve queries from foreign countries like UK, UAE, Dubai Etc. Minimum Order Quantity for foreign enquiries only: 1000 pcs. As the name suggests, Green Packaging Industries (P) Limited, believes in the philosophy of clean and green environment. Thus, it promotes products which are recyclable and are not harmful to the natural cycle. We are proud to manufacturing and supplying range of Jute and Cotton Bags. The bags we manufacture are made using high quality 100% pure raw material and are known for their original style and patterns. These bags are very light in weight and durable too. 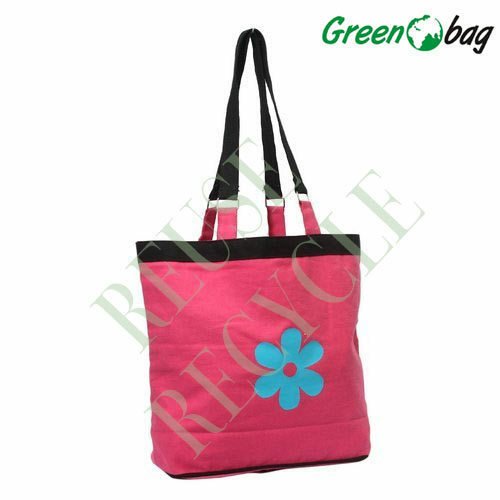 Green Packaging Industries Private Limited (GPIPL is a young company established under the aegis of the Elecom Group, in the business of manufacturing reusable and eco friendly bags. We have our manufacturing facility in Kolkata which houses all processes required in making bags of Jute, Cotton, Canvas and PP fabrics. We have been a part of the Indian Jute industry in different capacities since our inception in 2006. In a short span of three years we have already established our foothold in a competitive market and expanding it further. Our team is vital to our success and our culture paramount to everything we do. We conduct all business activities with integrity & adhere to the highest ethical & social standards. We offer a range of product like Cotton Canvas Bags, Jute Bottle Bags, Jute Bags, Canvas Bags, Jute Drawstring Bags etc. We are looking forward to serve queries from foreign countries like UK, UAE, Dubai Etc.